This year saw the release of a wonderfully silly and twitch-tastic roguelike first-person bullet hell by the name Tower of Guns. Pulling elements from classic games like Quake and Rogue, wrapping them up in a relentless bullet hell with a humorous assortment of random narratives. Written, designed, and developed by AAA industry vet Joe Mirabello. Tower of Guns burst into the scene a bit out of nowhere. No hype trains, no banners plastered across every gaming site on the web. With Mirabello's talent, determination, and dedication to pushing his game with what he had at his disposal, Tower of Guns quickly became a success. While being Mirabello's first solo project, he's no stranger to the industry. With Titan Quest, its expansion Immortal Throne, and the Kingdoms of Amalur MMO from the now defunct 38 Studios, he has experience with the trials and tribulations of game development. As the player, you take control of one of the characters in the randomly selected narrative, be it an exterminator hired to clear the robots out of the Tower for a restauranteur, or a little girl who's uncle has for whatever reason decided it was it a good idea for a child to run around with a gun in a Tower determined to kill you. These selected narratives run the gamut from chuckle worthy to outright absurd, and help give each of your attempts to conquer the Tower of Guns interesting and unique twists in how your experience is framed. Armed only with your wits and a gun of your own, you must make your way through a series of increasingly difficult rooms which are heavily armed with the Tower's murderous defences. Along the way you'll be able to grab a variety of collectables such as health, experience, coins for vending machines, useable items, and the occasional powerup. These collectables help you progressively become more powerful, but never to the point of ruining the challenge of the game. You will die, and the game makes sure to remind you of that with its ongoing death counter. The game also features a number of unlockables awarded for completing specific challenges in the Tower, earning you new guns and starting powerups. Each of the guns is unique and forces you to play the game slightly differently, allowing you to find something that fits your play style, or push yourself out of your gaming comfort zone. The powerups range from starting the game with a triple jump, to increasing your stats right away, or making sure collectibles never vanish so you can take your time clearing a room. For those of you with that insatiable desire for completionism, it keeps you coming back to rack up more ticks on that antagonizing blood red reminder that the game forces into your eye receptors at the end of each run. Tower of Guns is the type of game you can pump hours into without noticing, or simply play for five minutes until you're brutally murdered by a flying buzzsaw. I still haven't completed a run through the Tower, regularly coming seconds away from defeating the final boss. Yet I keep going back to this wonderful game, with its gigantic multi-shot canons, flying sawblade saucers, kamikaze orbs, and massive flying robot bulls. The environments, ranging from claustrophobia inducing metal rooms, cargo crates swinging over a seemingly bottomless pit, massive rivers of flowing lava, to spinning beams covered in huge deadly spikes, are always fun to fight your way through. Not to mention to find their secret areas for more loot. Tower of Guns is a must have for anyone who is a fan of indie games. It is a real testament of what can come out of the indie industry. With its endless replayability, it's bound to be a part of your library for a long while. 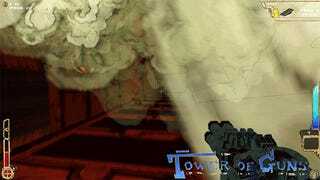 Mirabello was kind enough to let me interview him on his experiences in the industry, Tower of Gun's development, and where he's planning on going next. You have a few games under your belt from your time in the AAA industry, and the indie titles you've helped out on. How did you feel those experiences, AAA vs indie, contrasted? The workload, team dynamics, creative freedom, etc? Working in AAA is hands-down easier. Not only is the job description way more specific, meaning you can actually gain some level of mastery over it, but there's also a shared faith in the project...a morale support structure, if you will. That can be incredibly elusive when working on a super small team. There's this echoing chamber of doubt when you work as an indie, compared to the shared team investment of a large, big budget, highly trumpeted game. That said, the work is just all-around more fun as an indie. And if it isn't? Well then, change the work to something that IS. That's the beauty of the control you have when working independently. 38 Studios got a lot of coverage as it went under. It was big news for gamers and devs alike. What was it like being on the inside of that? What sort of knowledge did you take away from that experience? That's tricky—it was actually an awesome place to work. The development team was filled with inspirational people that I learned a lot from, and the studio was always very kind to me. That said, I do feel like the studio spread itself too thin, and demanded movement on too many vectors for a startup. The MMO project was pretty awesome and I feel like it had a good chance to be successful, but when I went indie I promised myself I would rely only on myself for starters, and start very very small to first prove that this way of living was even feasible. I don't feel like I would have had such reservations if I hadn't witnessed 38 Studios' implosion. Do you see yourself ever going back into the AAA industry, if you have the opportunity? So how did Tower of Guns initially come about? Was it the first thing you started working on after 38 Studios? It was—although it didn't congeal immediately. I had to spend many nights banging my head against the wall as I learned a lot of new things. I was very technically competent, but had gaps in my knowledge, particularly around scripting and animation, and so I had a long ramp up there. But I knew I wanted to make an FPS with lots of cannons, lots of random rooms, and lots of silly secrets. What games or other media inspired your work on Tower of Gun? Were there any games you played during development that aided in your creative process? Oh, there were tons. I mean, people say the game looks very Borderlands-ish when they look at it, but honestly that had very little influence on me other than that the art style was VERY quick to make. The bigger influences were Binding of Isaac, Cave Story, Contra, Quake, Howl's Moving Castle, Doom... we are collections of our experiences, and ToG is a product of who I am as a developer. That's one of the interesting things about being indie, is that there's a clarity of vision that becomes diluted with AAA games. That's not to say AAA games aren't wonderful, because they are, but there's rarely an authoritative voice guiding the experience. They are the products of collections of experiences, amalgams, of dozens (if not hundreds) of people, rather than just one. You originally came from an artistic background. Doing art for Titan Quest and the Kingdoms of Amalur MMO, and you've even released your own comic book. Did you have any experience with all the other aspects of game development beforehand? Or were you learning as you went along? That's actually not a comic—it's a novel! :-) It just has a comic-y cover! And it's full of my terrible sense of humor. As for my experiences though, I did have a substantial amount of development experience, particularly with the Unreal Engine and the content authoring tools. I had to fill in gaps with animation, game play scripting, platform deployment, FX creation, and a few other places. And, of course, I knew nothing about marketing, starting a business, and promoting a game. I've learned a lot. You developed Tower of Guns in UDK. Have you played around with any of the other development tools that have become more accessible to indie devs? Have you decided on moving to a newer set of development tools for future projects? While I've messed with a handful of editors over the years, UDK/UE3 was probably the most common one. It was certainly the most documented one. I've moved on to UE4 though for my next project though. UE4 is quite the powerful piece of software.. it could change the industry given how easy it is to use and how powerful it is. Regardless, it's certainly nice to see a bit of an engine arms race between Epic and Unity; Developers benefit from the resulting accelerated tool development. The game uses the Roguelike elements of randomly generated levels and perma-death, which seems pretty popular in the indie field. Why did you decide to make a Roguelike, and why do you think so many indie games follow that route? Do you want to know the reason roguelite elements are so popular now? It's because we were all playing Binding of Isaac and Spelunky two years ago when we were sitting around thinking about what to build next! I will not be surprised at all if in a year and a half there is a surge in games with Mordor-like Nemesis mechanics or something. We are creatures of exploration, and even something like Isaac's roguelite elements are just inspired extensions of previous games. It really comes down to people enjoying a mechanic, like the randomization of Isaac and thinking..."wait...could this work as an FPS? Would it be fun? What would it play like?". Once those wheels start turning it's hard to stop them. The game also uses randomly selected narratives for each playthrough. How did that idea come about, and how many different narratives and characters are there in the game? There are about thirty different characters, and about as many stories too, if I recall. I wanted to add a lot more. It's a playful commentary on the story of most FPS games and how they're just thinly framed excuses to shoot things, but I also was looking for ways to keep myself busy when I was away from my development machine during holidays. I didn't have any art authoring tools with me, but I did have a laptop, so I kept jotting down ideas for what the story in ToG could be. When it came time to chose for real...I just decided to choose ALL of them! I asked this question on the Steam forums awhile back, but I'd like to bring it up again. The game has a text-to-voice function in it, which is just an integrated part of the Unreal engine. What sorts of ideas did you have for actually using that within the game, and why did you end up deciding not to implement them? Hah, I never really had any plans for that. I figured it might be a nice option for those who didn't have time to read the little stories, since I couldn't afford proper voice acting for so many different dialog lines (several thousand, I'm sure)..but I never ended up liking the auto generated voice enough. What would you say one of your biggest challenges developing the game was? And how did you overcome it? Motivation, hands down. It's surprisingly hard to keep yourself working when you're faced with a mountain of work, no one else to share the load, and you're not even sure if what you are building is even any good. You just have to keep chipping away at it though until eventually you're too far in to give up. Tower of Guns got a lot of attention over the fact that it was a solo project. You put in over a year on the game. That's a hell of a lot to do on your own. Do you think you'll do more solo projects in the future, or are team projects more to your liking? I spent close two years on ToG (20 months, but then I supported it post launch too), by the end! And I probably WILL do more solo projects—or solo with some minor contracted work for various aspects. Perhaps if I make a project that makes obscene amounts of money then I'll expand into a team setting. I'm not really sure which I prefer though...I enjoy both climates, and both can offer unique advantages. It depends on the game, really. Now, as much as people love to focus on the "solo" aspect of some indie games, no big game is really made by a single person. Your wife and brother helped you out as well, yeah? What exactly were their roles? You're absolutely right—there's something romantic about doing everything solo, but that's not quite the accurate to say ToG was ENTIRELY solo. First there was my wife: Despite being a very experienced programmer, my wife didn't do any code on ToG—but she was crucial to the project being completed: She convinced me to do this in the first place. Then she acted as cheerleader, first-critic, and all around supportive person. She made sure I didn't waste my time on things no one would care about. She made sure the hugbots stayed in. She made sure I had my caffeine. She helped me run tradeshow booths and drove to conferences and helped me figure out taxes and all sorts of stuff. Oh, she did this while working at her normal job so we could still eat while we explored this indie road. She's the real hero of Tower of Guns, if you ask me. As for Mike, he did the music and the sounds. He also playtested a bunch, offered awesome feedback, and helped me decide on directions for mechanics in the game, and it's his quirky music that really helps set the tone of the game. I also had a LOT of volunteer testers, who are all in the credits of the game; friends, family, ex-coworkers, even complete strangers who liked the early-access versions and started offering feedback. One of them I ended up contracting with to help me with QAing the Linux version of the game, since he was so experienced with that OS. So, yeah, while ToG's content was authored "mostly" by me, and it's probably the most "solo" a project of that scope can be, it still wasn't entirely solo. I couldn't have made it alone. Unlike many indie games, Tower of Guns wasn't crowdfunded. Why did you decide to forgo that route? Well, there were a couple reasons. I didn't need the money to finish the game, and I wasn't sure if I wanted to spend all the time/energy on running a kickstarter. I still debate whether or not that was a good idea, as I could have done a lot more with the game if I'd had more available funding, but it is what it is. Do you feel Tower of Guns has been a success? And separately, was it financially successful for you? I feel it's been a success. One of the things about working solo (or mostly solo, as per the previous question) is that my needs were very modest, but I've been happy that the reception has been mostly positive and that so many people have enjoyed something I've made. I wasn't sure if I was going to make ANY money when I started this project, so being able to say I'll be able to move on to project 2 is something I feel quite proud of. You've released the game on Steam, The Humble Store, Good Old Games, Shiny Loot, Gamers Gate, and Indie Game Stand. How important did you find market saturation to be for sales? I'm not sure yet, honestly. I'd have to compare my results with a similar game that was released ONLY on one or two storefronts. I will say that, as the indie scene becomes more crowded, Steam is less likely to feature games on their bigger, site-wide carousels. However, some of the smaller storefronts, or some of the Steam key resellers, might still feature your game in such a way...so you can still gain a lot of attention, even on Steam, without ever having Valve "feature" you. I'm very curious how that dynamic will work in the next few years. So...uh...ask me again then. How about marketing? I know you bootstrapped your way through some conventions, and even managed to get some good recognition from a few of them. Did you see a considerable uptick from that? Absolutely. But the bigger thing is that the conventions gave me some face to face time with the press, who then were more partial to report on the game when it was released. Trade shows help you skirt past the email-slushpile that so many indie games can get stuck in—the journalist can see, at a glance, if your game is worth reporting on. I don't know if I'd say the same thing if I'd made a turn-based RPG...but for an FPS with hundreds of bullets on screen at any one time, tradeshows were a very, very, very good fit. Did you do any other 'traditional' forms of marketing for the game? Those things tend to be out of reach for most indie games. Do you feel that would have a significant impact on sales for your game, or indies in general? I actually have no idea. I might try some out in the coming year to see how they go! How did the gaming community respond to the game during release, and has that response shifted at all since then? The community reception was pretty warm, actually. I tried my best to stay on top of bugs, glitches, and incompatibilities, and was active on several forums, and the community seemed to appreciate that interaction. Since launch, the interest in the game waxes and wanes, but it surged quite a bit during Humble Bundle 13, where the game was suddenly put into the hands of 150,000 new people. Given that I was launching the Mac and Linux versions of the game at that time as well, it was almost like a whole new launch! Is there anything you wish you could have done differently with the project? Be it content, marketing, user-created content integration? Oh, I would have loved to have done stuff like user-created content. That would have been awesome. But, unfortunately, it was well out of scope for just me. I think, if I were to have done something differently, it would have been to push myself harder earlier. I would have loved to have had twice the content I ended up with! Are you working on anything new at the moment? Do you feel there's any sense of added pressure trying to follow up a successful game? Unfortunately, I'm not quite ready to talk about what I'm working on next, but yes, I do feel that pressure. It's mostly self-inflicted pressure, too. Fans and friends and family and press have all been asking, but it's myself that's the most critical of what I want to move on to, and that's been difficult shadow to step out of. The beginnings of projects are always the toughest. So what do you feel your largest takeaway is after releasing your first indie game? What have you learned that you feel could help other indie devs or those who want to become indie devs? That's a tough question. I think the biggest thing that helped me was finding ways to combat my own demotivation. ToG was a fun, silly, goofy, game, but its road to completion was very difficult because of my own self-doubt. I developed a lot of mental tools to help that—tracking my time, posting regularly to a tumblr dev log, putting out monthly builds. I think those tools were a major deciding factor in me actually finishing the project, actually. Accountability is often glossed over in the spirit of avoiding anything that sounds corporate or anti-indie-lifestyle, but it's an incredible motivational resource. Keep up with Mirabello's work by following him on Twitter @blankslatejoe. And go grab yourself a copy of Tower of Guns on your prefered computer platform! Or, keep an eye out for Tower of Guns to release on Xbox One, Playstation 3, and Playstation 4, in early 2015! If you have any positive or negative thoughts about this article, or would like to see more Indie Delves from me, let me know in the comments.